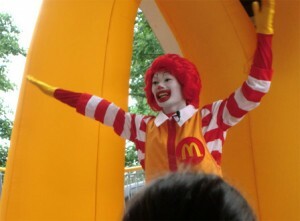 Ronald McDonald is a clown character used as the primary mascot of the McDonald’s fast-food restaurant chain. 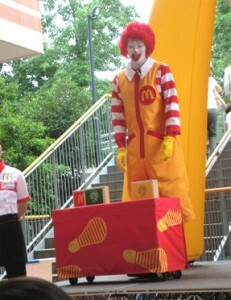 A survey shows that 96 % of children in the U.S. know him, he is one of the most popular character in the country. 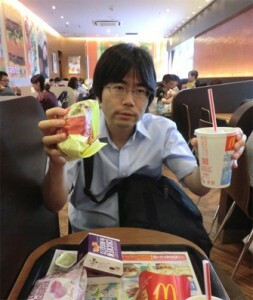 Also in Japan, he is very famous and most people have seen him at McDonald’s restaurant. But have you ever seen him moving and given him a high-five? Wow! 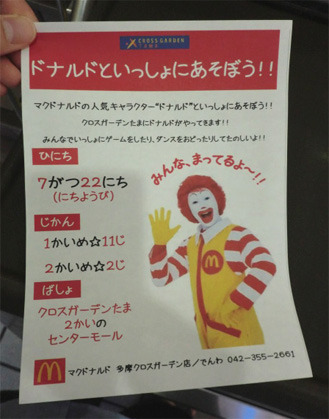 Ronald is coming to Tama city!! Is it true?? Why is he coming to this small town? For what purpose? 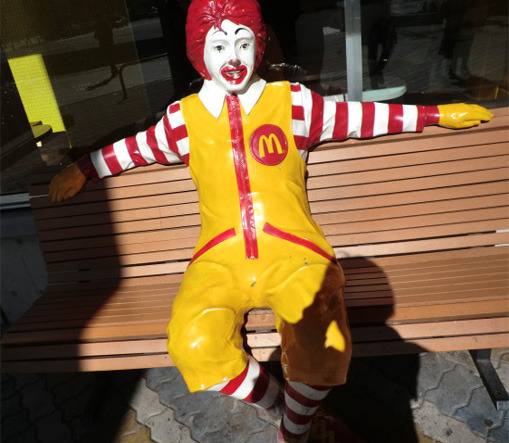 Many questions came up to the writer’s mind, and he got deeply interested in seeing Ronald. 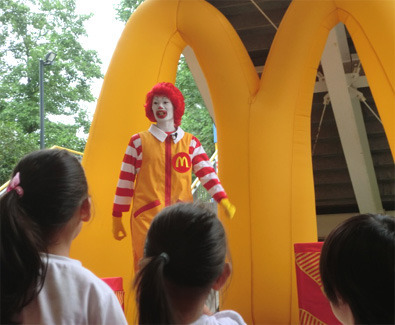 So he decided to go there and meet Ronald. 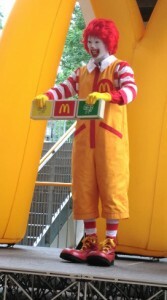 This time I would like to introduce his exciting report of meeting with Ronald McDonald. 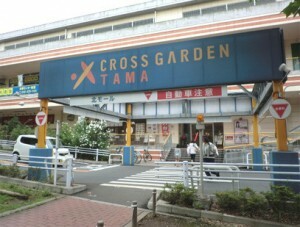 This is the glorious shopping mall “Cross Garden Tama” where Ronald will be coming today. 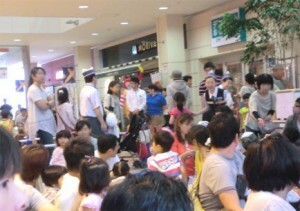 Wondering if such famous man is really coming here, the writer goes into the mall, then finds this space. 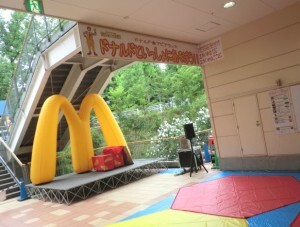 Wow, this is the “M” as McDonald!! This is the place the God will descend! It’s so exciting, but there is still plenty of time for the show. Well, let’s go get a hamburger first! 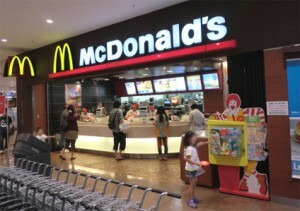 Here is the counter and seats of the McDonald restaurant. Filling up the time with filling up stomach until the show begins. 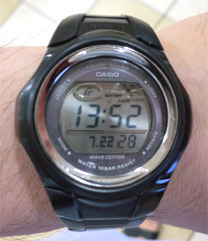 It’s almost the time. OK, let’s go! 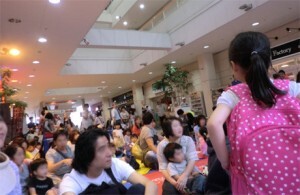 Oh, many people are there. And most of them are children. 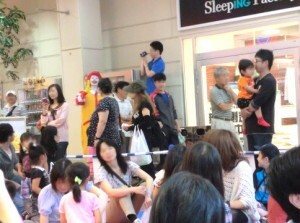 How popular the Ronald is!!! Anyway, let’s go find a good seat just front of the stage! It’s pretty good position, isn’t it? By the way, where is he gonna come from? Does he suddenly appear in front of us just like the God? Fishing around in my head, there is something red we can see over there. There is something with red hair approaching!! The God finally comes just front of us by walking naturally!! What a nice looking man!!! 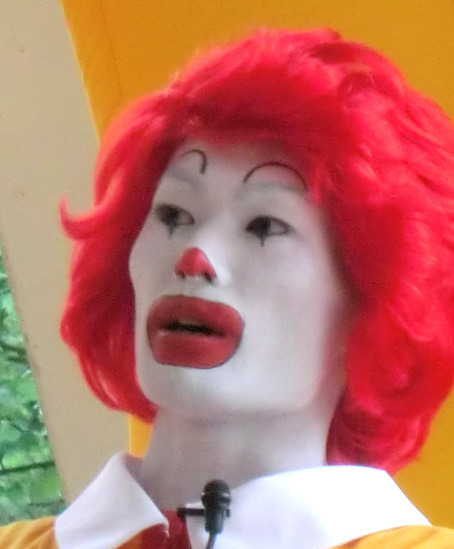 This is nice looking Ronald McDonald!! 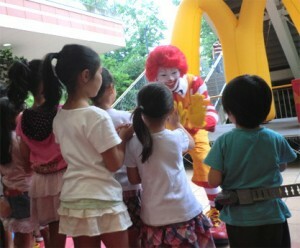 As soon as he comes, he starts with greeting saying hello, and the children answer his hello. And he asks them how we say hello in various language. 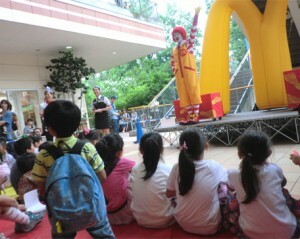 For his questions, the children show of their hands and yell out at him so loudly. How bustling! Adults can expect a vibrant future in this country. 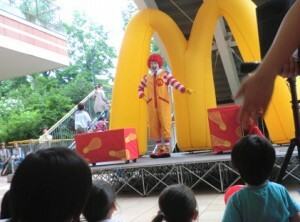 Then, the Ronald points his finger in the direction of a big box on the stage. 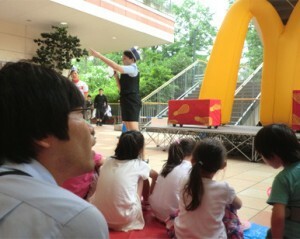 He asks the children how he can open the box. He opens the box, and picks up some small boxes from it. Can you imagine what they are?? The audience have reached a peak of excitement already! 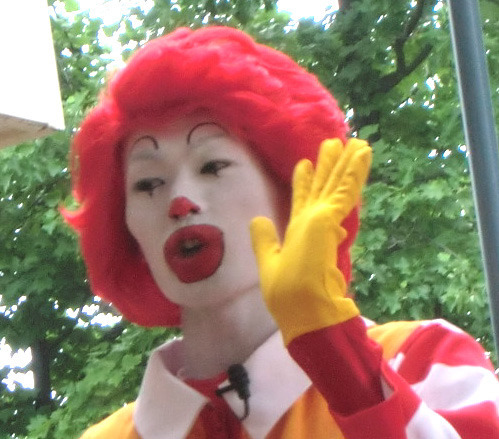 Yeah, it’s excellent, Mr. Ronald! Next, he directs everyone to stand up. This is just like a live concert! What a charismatic character he is! 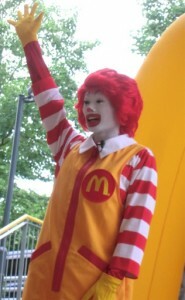 Welcome to the Ronald’ world! 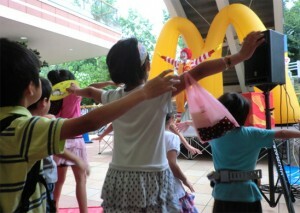 Also the writer tries dancing with the children. Um? it is really hard. He cannot catch up the charismatic dancing. 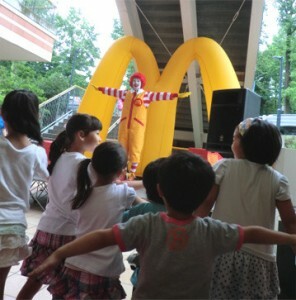 The God continues playing with the children like this, he seems rather enjoying the stage than the audience. 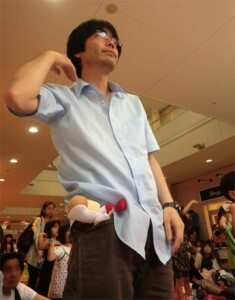 At last, he gets off the stage and comes to the audience. 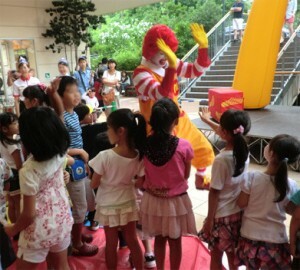 And starts giving high five with the children! 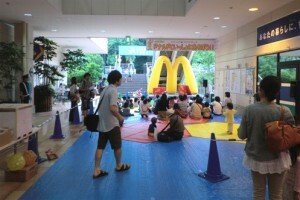 Of course, the writer stands in line between the children. 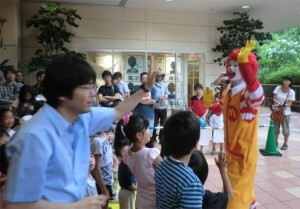 Though the writer was only the adult stood in line, but the Ronald gave him high five without hesitation. What a nice man he is!! 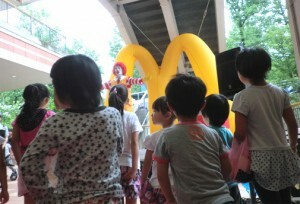 Thanks to Ronald, the audience including the writer spent wonderful time like a dream together, and had a feeling of exaltation that they have never felt. 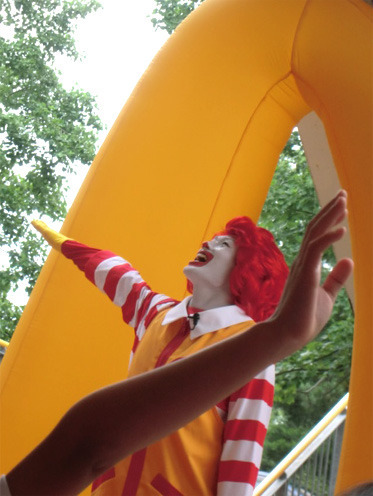 The writer of this article was so excited about meeting with the Ronald, he even called him “the God” on the article. I also really enjoyed reading this article, how about you? 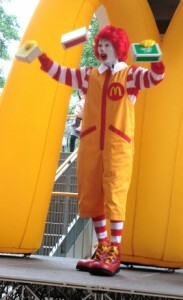 If you have a chance to meet the Ronald, I would recommend to go see him. He would give you a wonderful time like a dream. And please do not forget to buy hamburgers. 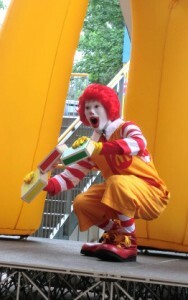 That’s the best way the Ronald would be excited about.